Your tax return check has arrived in the mail. Now you’ll finally pay off that credit card or add the extra cash to your savings for a rainy day. Or maybe you’ll blow your new fortune on a pair of designer shoes. Perhaps it’s time you instead considered a pair of synthetic and natural rubber boots in carbon black. You’ll need four as a complete set and you might need a spare. Why, you ask? Well, because instead of being on your feet, they’ll need to be mounted tightly to your car. Tires are an investment and, like a good pair of shoes, getting the right fit is important. When it’s time to start shopping, there are ways to get the most out of your hard-earned tax dollars. Once you find the right tires, there are some guidelines that will stretch your dollar even further, and since you’re economically savvy, you’ll want to make sure your new tires take you farther than the 2014 tax season. The most important task is making sure your tires are properly inflated. While this seems like a no-brainer, 81 percent of drivers in the U.S. don’t check their tire pressure, according to the Rubber Manufacturers Association. Simple upkeep helps extend the life of your tires and keeps you safe on the road. * When the tires are cold (at least three to four hours after the vehicle has been driven), check tire pressure with a reliable tire gauge. Be sure the valve stems have a plastic or metal cap to keep dirt out and seal against water and foreign objects. The tire’s proper inflation level – as recommended by the car maker – can be found on a placard in the glove box, on the car door or in the owner’s manual. * Check tire alignment once a year. Misaligned tires lower mileage and create unnecessary tire wear. 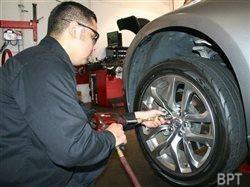 * Tires must be replaced when the tread is worn down to 2/32 of an inch to prevent skidding and hydroplaning. An easy test: place a penny upside down into a tread groove. If part of Lincoln’s head is covered by the tread, you’re driving with the proper amount of tread. If you can see all of his head, you should buy a new tire. For additional tire care and safety tips, visit www.yokohamatire.com or www.rma.org.